Antimicrobial resistance is an ever increasing therapeutic problem worldwide. The challenge of antibiotic resistance has been compounded by dissemination of extended spectrum β-lactamases (ESBL) producing Klebsiella pneumoniae and other Gram-negative bacterial strains. Though K. pneumoniae is a commensal of human intestine it can cause bronchopneumonia, ventilator associated pneumonia in hospitalized patients, urinary tract infections, postoperative wound infections, blood stream infections etc. Recently, ESBL producing K. pneumoniae strains pose major threat to patient care and infection control programe in health-care setup. ESBL were first reported in K. pneumoniae in 1983 in Germany. ESBL is plasmid mediated which encode antibiotic resistant genes resistant to oxyiminocephalosporins and monobactams but not cephamycins and carbapenems. They are inhibited by clavulanic acid, sulbactum and tazobactum. They also show false sensitive zone in routine antibiotic susceptibility test. The misuse and overuse of 3rd generation cephalosporins has contributed the resistance to these antibiotics. Hence, the present study was undertaken to detect the incidence of ESBL producing K. pneumoniae strains isolated from different clinical specimens in the Department of Microbiology. A total number of 120 K. pneumoniae strains were isolated from different clinical specimens like blood, urine, pus and wound swab, sputum, tracheal secretions, body fluids etc., and were identified by conventional tests in the Department of Microbiology. The study was approved by Institutional Ethical Committee. The type of study was cross sectional observational study. The clinical specimens from indoor patient departments (IPD) were only included in the study. Antibiotic susceptibility test for all 120 K. pneumoniae strains were done by Kirby-Bauer disc diffusion method  according to Clinical Laboratory Standard Institute (CLSI) Guidelines, 2016. The lawn culture of test strain (turbidity adjusted to 0.5 Mc Farland Standard) was done on Mueller Hinton (MH) agar plate. The antibiotic discs were put on inoculated MH agar plate with all aseptic precaution. Six antibiotic discs were put on 90 mm diameter plate. The antibiotic susceptibility test was done for amikacin (AK-30 μg), ceftazidime (CAZ-30 μg), cefotaxime (CTX-30 μg), cefpodoxime (CPD-30 μg), cefipime (CPM-30 μg), cefoxitin (CX-30 μg), Co-trimoxazole (COT-25 μg: 1.25/23.75 μg), ciprofloxacin (CIP-5 μg), imipenem (IPM-10 μg) and colistin (CL-10 μg) etc. For urine specimens additional disc of nitrofurantoin (NIT-300 μg) was put. The control strain for antibiotic susceptibility test was Escherichia More Details coli ATCC 25922. ESBL production was detected by screening test and phenotypic confirmatory tests as per CLSI Guidelines, 2016 for enterobacteriaceae. Reduced susceptibility to ceftazidime, cefotaxime and cefpodoxime was observed as screening test. The phenotypic confirmatory test was done by combined disc method. In combined disc method, disc containing ceftazidime (CAZ-30 μg) and ceftazidime plus clavulanic acid (CAC-30 μg/10 μg) and also cefotaxime (CTX-30 μg) and cefotaxime plus clavulanic acid (CEC-30 μg/10 μg) were used. After incubation, an increase in zone diameter of ≥5 mm with CAC disc as compared to CAZ disc alone was considered positive for ESBL production. Similarly, an increase in zone diameter of ≥5 mm with CEC disc as compared to CTX disc alone was considered positive for ESBL production. The control strain used was K. pneumoniae ATCC 700603. All the antibiotic discs and culture media were procured from HiMedia Laboratories, India. A total number of 120 K. pneumoniae strains were isolated from clinical specimens and were received from IPD patients of different clinical specialities. 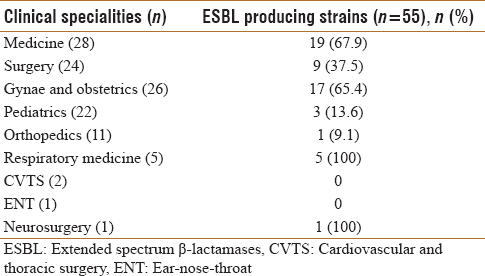 [Table 1] shows the incidence of ESBL producing K. pneumoniae strains studied. Out of total 120 strains studied, 55 (45.8%) strains were ESBL producers. [Table 2] shows the isolation of K. pneumoniae strains isolated from different clinical specimens. Out of total 120 K. pneumoniae strains studied, 45 (37.5%) were isolated from urine followed by blood 30 (25%) and 21 (17.5%) were isolated from pus and wound swab. Out of these 45 strains isolated from urine 23 (51.1%) strains were ESBL producers. From sputum 87.5% strains were ESBL producers. [Table 3] shows, the: Isolation of ESBL producing K. pneumoniae strains isolated from different clinical specialities. Out of total 120 K. pneumoniae strains studied, 28 (23.3%) strains were isolated from medicine ward, followed by 26 (21.7%) were from gyne and obstetrics ward. From medicine ward 19 (19/28 i.e., 67.9%) strains were ESBL producers followed by 17 (17/28 i.e., 65.4%) strains from gynaecology and obstetrics ward. [Table 4] shows that out of 120 K. pneumoniae strains studied, 55 (45.8%) were ESBL producers. The screening tests were done by Kirby Bauer disc diffusion methods as per CLSI Guideline, 2016 using cefotaxime (CTX), ceftazidime (CAZ) and cefpodoxime (CPD). It was found that (43/120 i. e. 35.8%) strains were resistant to cefpodoxime (CPD), 46 (38.3%) strains were resistant to cefotaxime (CTX) and 49 (40.8%) were resistant to ceftazidime (CAZ) respectively and were considered screen test positive for ESBL but there were 3 strains which were only resistant to cefotaxime and just sensitive to ceftazidime (Zone diameter 17 mm) by screening test. Hence, only 6 (10.9%) ESBL producing K. pneumoniae strains were missed by screening test because some of the strains may give false positive zone in disc diffusion method and leads to therapeutic failure. All 43 strains resistant to cefpodoxime were also resistant to cefotaxime and ceftazidime. [Table 5] shows detection of ESBL producing K. pneumoniae strains by confirmatory tests. All 120 K. pneumoniae strains were tested by confirmatory test using combined disc method as per CLSI Guidelines, 2016. In combined disc method cefotaxime (CTX) and cefotaxime-clavulanic acid (CEC), 48 (87.3%) strains were positive for ESBL production, whereas using ceftazidime (CAZ)/ceftazidime-clavulanic acid (CAC) 52 (94.5%) strains were positive for ESBL production. The 3 strains which were only resistant to cefotaxime (CTX) and just sensitive to ceftazidime (CAZ) by screening test were also positive for ESBL by CTX/CEC but not by CAZ/CAC. So these strains were designated as CTX-M type ESBL. By confirmatory test using combined disc method 45 (81.8%) were positive by both CTX/CEC and CAZ/CAC. Hence, total 55 strains were ESBL producers including 52 strains by using combined discs CAZ/CAC and those 3 strains which produced CTX-M type ESBL. [Table 6] shows antibiotic sensitivity profile of 120 K. pneumoniae strains studied. All (100%) strains were sensitive to colistin, the lowest sensitivity is observed with co-trimoxazole 37 (30.8%) followed by ciprofloxacin 49 (40.8%). Sensitivity to nirofurantoin was tested in 45 urine samples only and 26 (57.8%) strains were sensitive. Presently antibiotic resistance is a major threat to patient care and Infectious Disease Control world wide. K. pneumoniae strains are intrinsically resistant to some antibiotics like Ampicillin but K. pneumoniae can also produced ESBLs which are plasmid mediated and can be disseminated easily in health care set up, not only among K. pneumoniae strains but also among other Gram-negative bacteria. The detection of ESBL producing K. pneumoniae strains phenotypically by combined disc methods can be done routinely in Clinical Microbiology Laboratory. Though polymerase chain reaction (PCR) is taken as gold standard, its limited only to few laboratories in India because of its high cost, expertise required and different types of ESBLs produced world wide. In the present study, 45.8% ESBL producing K. pneumoniae strains were isolated from clinical specimens whereas Varaiya et al. in 2008 have reported 35.3% of ESBL producing K. pneumoniae strains from clinical specimen. In the present study, 41.8% ESBL producing K. pneumoniae strains were isolated from urine. Kader and Kumar have reported 57.5% of ESBL producing K. pneumoniae strains were isolated from urine. In 2011 Parveen et al. have reported 97% of ESBL producing K. pneumoniae strains from blood culture, but in the present study 21.8% of ESBL producing K. pneumoniae strains were isolated from blood culture. In 2015 Singh et al. have reported 35.3% ESBL producing K. pneumoniae strains. Scope of the study is immense, because the first step in prevention of ESBL producing strains is early detection. Limitations is that other types of β-lactamases should have been studied. Molecular methods e.g., PCR was not done as it is costly, require expertise and can not detect new variants. Hence, to conclude, all K. pneumoniae strains, which are one of the most common isolate in Clinical Microbiology Laboratory should be tested phenotypically for ESBL production routinely. Datta Meghe Institute of Medical Sciences University, Nagpur. Knothe H, Shah P, Krcmery V, Antal M, Mitsuhashi S. Transferable resistance to cefotaxime, cefoxitin, cefamandole and cefuroxime in clinical isolates of Klebsiella pneumoniae and Serratia marcescens. Infection 1983;11:315-7. Washington CW Jr., Stephen DA, Williams MJ, Elmer WK, Gary WP, Paul CS, et al. Enterobacteriaceae. In: Koneman's Color Atlas and Textbook of Diagnostic Microbiology. 6th ed., Ch. 6. Philadelphia, USA: Lippincott Williams & Wilkins; 2006. p. 211-302. Clinical and Laboratory Standards Institute (CLSI). Performance Standards for Antimicrobial Susceptibility Testing. CLSI Supplement M100S, M02-A12. 26th ed. Wayne Pennsylvania, USA: Clinical and Laboratory Standards Institute; 2016. Carter MW, Oakton KJ, Warner M, Livermore DM. Detection of extended-spectrum beta-lactamases in Klebsiellae with the oxoid combination disk method. J Clin Microbiol 2000;38:4228-32. Varaiya AY, Dogra JD, Kulkarni MH, Bhalekar PN. Extended-spectrum beta-lactamase-producing Escherichia coli and Klebsiella pneumoniae in diabetic foot infections. Indian J Pathol Microbiol 2008;51:370-2. Kader AA, Kumar A. Prevalence and antimicrobial susceptibility of extended-spectrum beta-lactamase-producing Escherichia coli and Klebsiella pneumoniae in a general hospital. Ann Saudi Med 2005;25:239-42. Parveen RM, Khan MA, Menezes GA, Harish BN, Parija SC, Hays JP, et al. Extended-spectrum β-lactamase producing Klebsiella pneumoniae from blood cultures in Puducherry, India. Indian J Med Res 2011;134:392-5. Singh M, Kakati B, Agrarwal RK, Kotwal A. Detection of Klebsiella pneumoniae Carbapenemases (KPC) among ESBL/MBL producing clinical isolates of Klebsiella pneumonia. Inter J Curr Microbiol Appl Sci 2015;4:726-31.